In 1977 Bishop Festo Kivengere escaped his native Uganda. In February of that year Jamini Luwum, The Archbishop of Uganda was executed by Idi Amin for opposing his brutal killings of the population. His last words to Festo were: “They are going to kill me, but this will be for the glory of God”. In fear for his life and that of his family Festo fled Uganda walking over the mountains out of his native land. On one of his trips, he arrived in Boston; A perfect escape into Egypt, from oppression to the belly of the Empire. Festo told me when I asked if he had ever harbored thoughts about killing Idi Amin, that Amin once showed him a gun and asked menacingly, “If you had the chance what would you do with this weapon?” Festo responded,“The gun is your weapon, my weapon is love.” In a book about his experience with Idi Amin entitled, “I Love Idi Amin”, Festo writes about his anger about the dictator’s violence to his friends and his people. The experience so hardened him that he had to find a way to open again to the love of Christ. Festo was a wonderful counterpoint to the comfortable, super-personal and socially disconnected evangelism of much North American Christianity. To experience the love of Jesus in the midst of struggle and oppression was the example of faith that I needed to sustain me at the time. His theology challenged Bonhoeffer’s in Germany and yet his presence in Boston was a powerful moment for Tess, my wife, and me. Christopher was an infant. Born with Down syndrome, the fragile child was working in us a completely new understanding of what was before us as his parents. For days Festo carried on a healing mission in the region. Tess and I arrived at Trinity Church in Boston with Chris in arms. At the appointed time we walked up the aisle of the church and Festo laid hands on us and on our son and prayed for us. That day and others around that time transformed my life and my ministry. Nothing changed and everything changed. It is like so much healing. There comes peaceful confidence that this will work out, that what seems to be a hill to climb will be a blessing. There followed an acceptance of who this remarkable young being was and is, in his own right. Ever since that time I have sometimes been given the gift of sight to see through the eyes of those with special needs. I was given the blessing to see them first as children of God and not children with disabilities. But not always, I am still my old impatient self who frets and worries about his vulnerability. And so the son reminds the father of our existential dilemma. We are on our way to God and except for those holy moments of breakthrough, we are not all there yet. On that day the new Christ came again and through the hands of Festo,* touched and blessed us. *Festo returned to Uganda after Amin’s death. He died from cancer in 1988. May his soul and souls of all the departed through the mercy of God rest in peace. The late Bishop Sheen on his television show mentioned a woman who argued that the world was supported on the back of a turtle. He asked, “What supports the turtle?” “Another turtle.. It’s turtles all the way down.” For us this Christmas, it’s shepherds. Shepherds all the way down and from the beginning. From the beginning the Biblical Story is about shepherds. The word Hebrew, my Hebrew Bible professor told me, is derived from Habiru* which means people of the land outside the city gates.The Biblical world view is one from the outside. It is often the perspective of those who look through the eyes of nomads, shepherds, prophets, exiles, and those on the margins. Shepherds are often distrusted and a flock of sheep can do a lot of damage to farmland and forests. Those people outside the city gates also organize and become a real threat to the status quo. 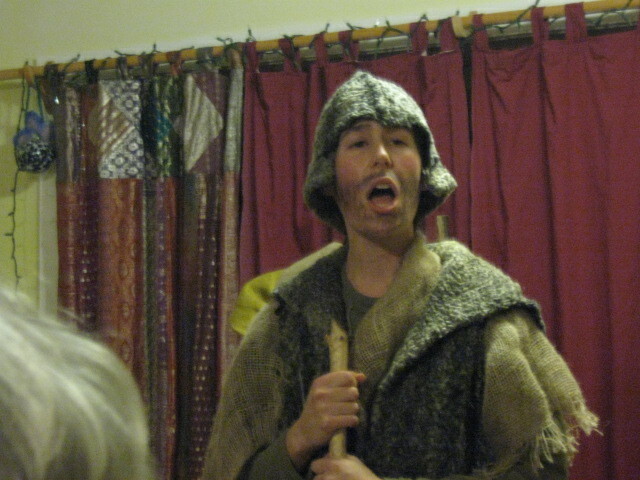 One of the Shepherds in the “Shepherd’s Play”. Luke’s inclusion of the Shepherds as a center piece of the Nativity is a classic biblical world view that looks in from the outside. The outsiders are the ones who are first given the news of the birth. It is to shepherds not Kings or the powerful the angel appears. 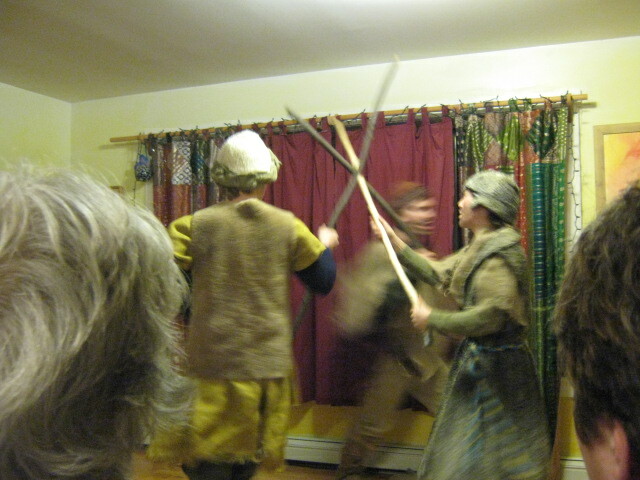 Every year at this time people from Heartbeet in what we call the Northeast Kingdom in Vermont, perform the Shepherds Play. 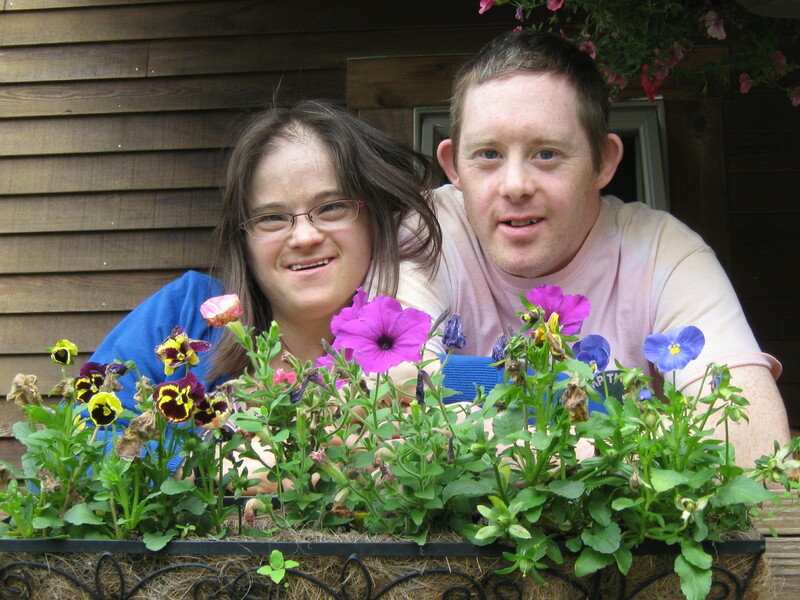 Heartbeet is one of those rare communities where people with developmental disabilities and so-called ordinary people live together in community. My son and his girlfriend as well as over forty others live here year round, farm the land, tend the animals and celebrate the seasons. Heartbeet owes its origins to the inspiration of Rudolph Steiner who also established the first Waldorf School for the children of factory workers in Walldorf, Germany. 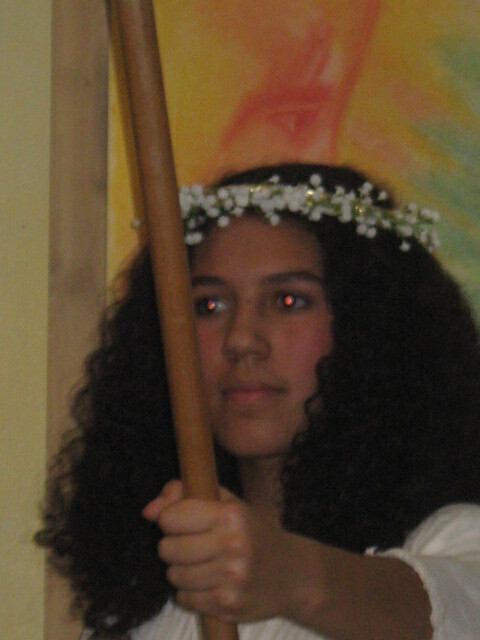 During the Christmas season it is the tradition to celebrate “The Shepherd’s Play”. The play originated from farmers in a small town on the Danube River, East of Vienna. The Oberufer Shepherd’s Play at first appears as a traditional Nativity Play. Mary and Joseph an Angel, innkeepers and others set the scene for the main players: The Shepherds. The boisterous, slap happy, stunned, cold and hungry shepherds are the laugh a minute comic relief to the more reverential scenes of the holy family and the Angel. Into the holy night the Shepherds bring mirth, slapstick, and perspective. At Heartbeet the play includes some of the classic outsiders: those among the community with special needs. At Heartbeet they are insiders, in fact in the play they are the innkeepers. Chris and Annie, my son and his beloved, are the kinder ones, but eventually do what they would probably never do in real life, they turn their backs on the holy family. It is a play of course and yet these two with Down Syndrome shine the light of this season on our failure to find room for the Child of God to be born. The city of our lives are overcrowded and over taxed and we can find no room. But the shepherds hear and show up. It is no surprise to them that Jesus is born in a stable or a cave or in the middle of a city street. It is no less true for Heartbeet. There is life being born here, where those who were on the very edges of our communities have found an Inn that did not turn them away, and looked to them as those with gifts not disabilities. Chris and Annie write poetry, help at the soup kitchen in town, work in the community of Hardwick and help with their friends to create art, weave, and sustain the Heartbeet community by farming the land. This Christmas Eve the community will walk to the barn to visit the animals. Cows, horses, chickens, ducks and geese, pigs and maybe even sheep, a few years ago they even had llamas: each of these creatures will be treated to the visits of all the people and some of their families. Candles will light the large room and songs will be sung. The presence of the holy will be honored in that place. And if you chose to come, you would not be turned away. * Habiru references the large number of semitic peoples who were largely nomadic and rebels, threats to the extablished Egyptian order. Others dispute this theory. They say the origin or the word Hebrew is from ibri, which means from across the river or those who crossed the river. Either one is fine with me. Yet the idea that the Hebrew people were a collection of nomadic peoples who came to the worship of One God and bonded around that faith, is attractive to me. “The blind see, the lame walk, the lepers are cleansed and the deaf hear. Miracles are more about commitment and tenacity than magic. In Haiti Sr. Joan, a young Boston lass and a Sister of St Margaret arrived to grinding poverty. When she asked a man what would happen to the blind child he held, he told her, “The child will die.” Sr. Joan scooped the child in her arms and announced, “She will not!” Thus, St Vincent’s School and Hospital began in Port Au Prince. Sr. Joan has since died. During her lifetime she brought the Sisters of St Margaret to Haiti. Many doctors, dentists and others came from the States and around the world to help the school as it expanded to teach the blind to read and to play the violin and to learn skills for their survival. One of her students, a blind man now is a teacher in the school. Another,a teenager, played his violin at Symphony Hall in Boston. There was ne’er a dry eye in the house. Sr. Joan knew how to make miracles happen. She expanded to a school for children with other handicaps and poor children from the neighborhood. One of the children who were one of Sr. Joan’s students knew her as a strict task master. This woman who was a member of the parish I served in Connecticut is a homeowner and a single mother with three fantastic and beautiful and talented children, and she holds a good position with a health care organization. Sister Joan expanded the work of St Vincent’s to the lame she provided them with orthopedic surgeons who would come and stay for weeks and months at a time, and provided and constructed prosthesis for those who had need of them. She outfitted the deaf with therapy, hearing aids and taught them braille and sign language. A few miles away an order of Roman Catholic Nuns makes a home for lepers. While there limbs do not regenerate, they live in a spotless facility with a courtyard and patios overlooking it. In the middle of the courtyard is a twenty foot Poinsettia tree. Yes a tree. The flowers are yellow, orange, red and green and they were in abundance in late April when we were there. In the women’s dormitory, a woman with no legs or fingers sat on her bed. She knitted with the joint of her thumb and forefinger. The product was childlike and in its way a work of art. Miracles happen because people of faith refuse to turn away from God’s poor. They believe that the blind, deaf, lame and the poor can be healed and given tools for life. Miracles are more a product of commitment and tenacity than magic. Go to Haiti and see for yourself, or visit a local soup kitchen this Christmas. It will open your eyes, break your heart, and give you hope. One of the breakthroughs into God’s gracious life was to begin to see church and liturgy through the eyes of children. Parents and grandparents brought their children to church and they would be uncomfortable during those Sundays when we didn’t have Church School. In my early days I wanted the children with us during the entire liturgy or some part of it, and Don the wise head of the Sunday school asked, “And what do you think the children prefer?” The answer was obvious. Yet the liturgy is supposed to be a time of teaching, even for the children, and they needed to experience the church as both a place of welcome and one where they could explore the way a child explores. I watched as Jillian age three would walk up into the sanctuary and look at the light and the windows. Another child led the dancing corner and when the music played they would dance to the beat or not, moving in some improvised ballerina steps they had learned in dance class. Younger ones were often too antsy to be comfortable in church. They became my gift and my continued exploration into the life of the child. One of the first Sundays in Stratford, after a long and difficult search, Hannah who was still a babe in arms was clearly uncomfortable and wanted to move around. I reached out to her during my first sermon which I gave in the aisle, and she cuddled right up to me as I continued to talk. The movement, the sound of the voice, and being able to see and being higher kept her attention. Of course a little movement, rocking, swaying, moments when I looked at her and her inclusion in what I was telling the adults, seemed to work. Yet more than that Hannah was the heart opener for me. She in her child like way knew that after the grueling process of the search and moving the family to a new home, she conveyed to me that I was safe here, I was at home. And in many ways I was. In this way these forays of children to the altar were a kind of ministry with them and with me. I love holding a child in my arm during the liturgy, their hanging on to the sounds, the actions, the light, the people watching and their watching them. They loved being the center of the action and I loved letting them in to the mystery and the beauty of the language and the drama of what we were doing: the re-enactment of Jesus last supper with his friends. 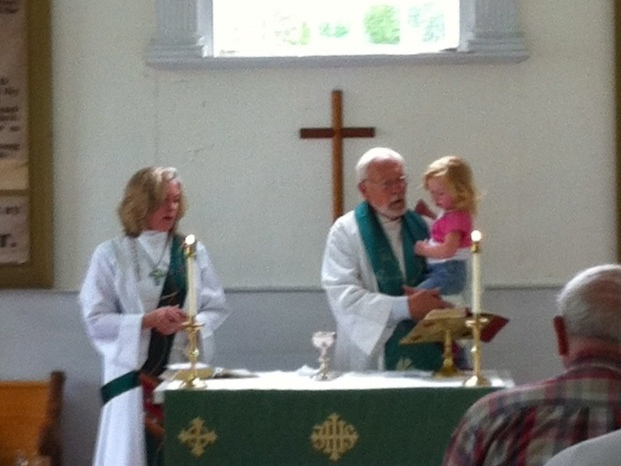 Children were invited up to the altar during the consecration. They would follow my actions during the Eucharistic prayer. There was always one child, who was moving about, but the older children helped with the little ones and I thought a child hanging on the altar rail was a great use of holy space. A few months ago, young Cypress was visiting with her grandparents. I had not met her before. Her mother is a Lutheran Minister and was away at a conference. Cypress clattered in the back of the church with toys her grandparents thought would keep her interest. It was not working. So I asked if she would like to come help me with the service. The result is the picture on this blog. It is a testament to all children and what they bring to us as we allow ourselves to see the worship of the church through their eyes and to know that what we do here is not only for us but for the future. Or fathom who it was who offered thanks. Tell yourself to live perpetually in gratitude. And the woman who asks for coins or dollar bills on the sidewalk. Thank her for opening your eyes. And yet I know I will forget. I will look away. My old friend is the local rabbi here. I told him a few weeks ago that he is John the Baptist, “A Voice Crying in the Wilderness”. I’ve known him for over fifty years. 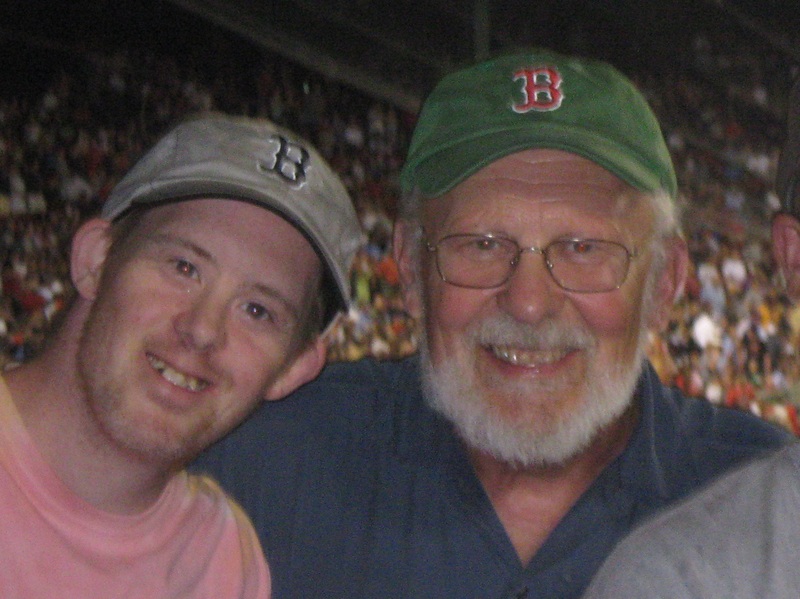 We were college room mates and he has been crying his cry for justice for the poor, for an end to war, and racial and interfaith understanding and conversations for as long as I’ve known him. He grows older, as we do, and has moments of real discouragement. This old world is going to destroy itself he cries. And what can I say. He is like a canary in the mine. A little paranoia, whether you are a Jew or not, is maybe a good thing. I remember when he was attending a Christian Seminary, Yale, and I was beginning to worry that he might convert. “Joshua,” I said, “You’re a Jew. Your parents and grandparents are Jews; you have to be a Jew for us.” He remembers another person saying that to him. It might be true, but I felt the truth of those words in my bones and my gut. We needed him to be a Jew for us. Not as some caricature of the Jew that many of us Christians raise up, but as a perpetual warning and mirror to our ugliness when in a majority, and our perpetual blindness to where and from whom we come. Even more, we need him to remind us that at the very heart of Judaism is a God of Mercy, Compassion, Kindness as well as Justice. –To keep us from the sin of making the Jews the lawyers and the Christians infused with a Gospel of love. 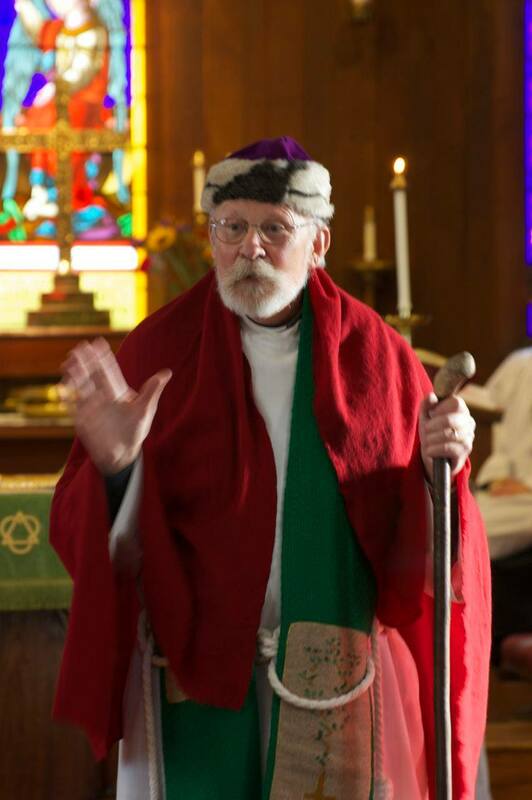 When Joshua organized a Thanksgiving Service for the Community he invited the regulars, the various Christian denominations, his own Conservative congregation, and the Muslims, Hindus, Buddhists, Native American and some other native religions. It was a superb celebration of Diversity. And yet the circle as wide as he draws it is never complete. He reaches for a higher and far off goal, the Peaceable Kingdom of Isaiah 11:1-10, where the lion lies down with the lamb. Now this is probably not a good idea, and it must be certainly uncomfortable for the lamb. Maybe it’s easier to beat our swords into plowshares and our instruments of war into housing for the homeless and the poor of the earth, or for growing food to feed the starving children. Now, THAT kingdom could be within our reach. All we need is a billion John the Baptists, their voices crying in the wilderness, their voices raised to draw people to come to the water to be baptized with the Holy Spirit and Fire. Any one for locusts and wild honey? And thus may Joshua’s voice and John’s and their spiritual descendants never be silenced.